Michal holding a real starfish that Eric found tumbling in the waves. If it was alive I hope you put it back. Love this! 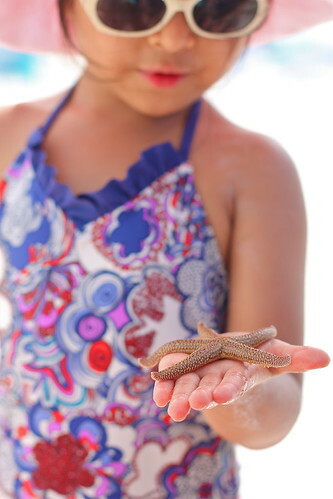 A few years ago...okay, like ten, when Hilton Head was our "every summer" destination, our daughter also found a live starfish. She and her starfish spent an entire afternoon in a tide pool. Wish I'd had a better camera back then...still, I cherish the photos I have and the memories of when she was just a little girl. Now she's 15 and becoming a young woman. Time flies. You have really captured perfect moments on your photos! Your twins are great kids too! I'm Li and I own an online store for girl's dresses. I sell Chinese dresses and American Formal dresses too that are affordable yet of great quality that I'm sure your twins will look great on them. We are also having our PHOTO and REVIEW CONTEST which you can join if you wish. It will be an honor to see your kids wear our dresses. The starfish was very much alive, was held gently, photographed and then taken out into the ocean and let go, where it stood a much better chance of not washing up on the beach. What a fabulous photo Kristi! Looks like you are having a wonderful vacation!! Love all the pictures, it was nice catching up on your blog!! Safe travels back home!! How fun all those photos of your vacation Kristi, the colors are just amazing! !